Fun to picture the various “old-guard” death metal bands sitting around in a room, collectively asking “Can you believe we’re still going?” What was once thought a young man’s game, death metal is still guided by its veteran, legendary bands. It’s either a reflection of their enduring nature, or the lack of would-be up-and-comers to take their place, although you could argue there’s no shortage of quality DM bands mucking about. Nevertheless, Suffocation are on the brink of their 30th year of existence, a period marked by classic albums, a quiet breakup in 1998, then a reformation in 2002 that has yet to let up, as evidenced by the band’s new …of the Dark Light. Drummer Eric Morotti and second guitarist Charlie Errigo are the new faces here, joining standbys Frank Mullen (vocals), Terrance Hobbs (guitars) and Derek Moyer (bass). While Errigo’s contributions are difficult to decipher, it’s Morotti who shoulders most of the album’s workload. From the jump, he’s on top of things during “Clarity Through Depravation,” reeling off heavy-handed drumming fitting of Hobbs’s trademark riff approach. As the album works its way through the running order, Morotti gets more than enough space to work, whether it’s on “Return to the Abyss,” or the best song of the lot, “Caught Between Two Worlds,” a stalwart Hobbs tech-death foray. 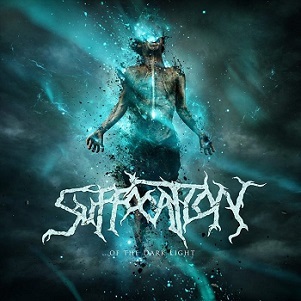 Seemingly with nothing left to prove other than trying to keep pace with Cannibal Corpse and Obituary, Suffocation have furthered validated their existence with …of the Dark Light. 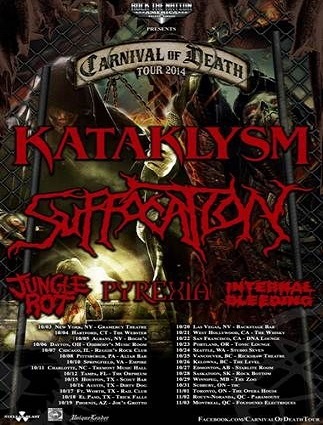 Technical death metal often burns out the fastest, but Suffocation show no signs of burning out…or fading away.